The Armagh Gaelic Football Club Championship was hit by farce on Friday night as former All-Ireland champions Crossmaglen were forced to play against a group of mostly middle-aged men. Most of Dromintee's regular players did not turn up to the quarter-final game because they were attending a wedding. This forced the Dromintee outfit to hastily cobble together a team made up of veteran club members. The match started but Crossmaglen then opted to use the occasion to train. Crossmaglen were leading 1-7 to 0-0 after about eight minutes at the Athletic Grounds when their team managers Oisin McConville and John McEntee called the players aside and began to conduct a training session. For the remainder of the match, the Dromintee personnel, at least one of whom was wearing jeans, opted to gently kick the ball among themselves as the Crossmaglen players were put through their paces in the training session. Only a couple of Dromintee players were wearing football boots with many not wearing any form of sporting footwear. At one stage during the "match", a Dromintee player kicked the ball over the sideline and this led referee Kevin McNeice to call upon Crossmaglen to take a line ball to restart the game. 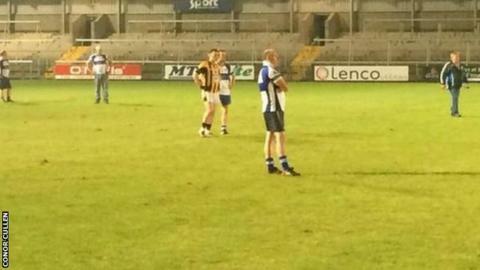 Crossmaglen star Aaron Kernan duly kicked the ball back into play before resuming his training with his team-mates. BBC Sport Northern Ireland understands that Dromintee were warned by Armagh county officials that a failure to fulfil the fixture would leave the club in danger of being handed a total 48-week ban which would have prevented games being played in the under-age grades as well. Fearing such a punishment, the club opted to cobble together the team from veteran club members attending the game. Dromintee are thought to have requested a postponement but without success.